Ahhhh, Sesame Street Counting Cafe. This is another game my brother used to frequent, and I wonder sometimes how he actually found entertainment in this title as an adult, even if he is a huge Sesame Street fan. Counting Cafe by EA Kids is based on the most famous of young children’s television shows, Sesame Street. It features Grover as a waiter working in a restaurant serving Mr. “Fat Blue” Johnson, a regular customer as featured in many Sesame Street episodes and short skits. You play as Grover serving Mr. Johnson during the five different meals of the day: breakfast, brunch, lunch, dinner, and dessert. There is one day for each level, and seven levels in all, one for each day of the week. There really is no storyline to this game, except that you have to collect stars from Mr. Johnson after successfully serving him each meal for the day. The gameplay is repetitive, something commonly seen in Sega’s “Sega Club” series of games. 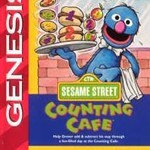 The gameplay consists entirely of Grover jumping to shelves to collect a food item to serve to his lone customer, according to his order. There are different types of food ordered for each level, but no level contains more than three at a time. For example: At breakfast, Fat blue can order muffins, bananas, and eggs, while at dinner he can order steak, bananas, and pie. There is literally no variety in gameplay in this title, and you can clearly see that it was made for little kids, even if you don’t pay attention to the game’s early childhood rating. You basically do all of two things: jump to get food off of shelves, and walk around to each shelf, or to Cookie Monster if you mess up to clean your tray and start again. There are appearances of different Sesame Street characters, from Ernie, Bert, Betty Lou, and the like. They either chuck food at you in some way (Bert hits eggs with a golf club, Farley throws pies, etc. ), or they try to grab food off of your serving tray (Oscar uses a fishing pole). Each level is the same thing over and over again, serving Mr. Johnson five times. After he’s eaten every meal, a monkey comes along and grabs the last star he gives you and runs off. Grover heads outside and jumps along platforms and clouds and other things until he can reach the monkey. Simply touching the monkey ends the level, and you get your fifth star. Again, this game is incredibly lacking in the gameplay department and is very boring and bland. The graphics in this game are simple and plain. The backgrounds are colorful, but it’s mostly one kind of color for wallpaper, and there isn’t exactly much to be colored aside from shelves and ladders and Cookie Monster’s room. Everything is straight up one color; there are no different patterns or anything of that nature. There are some big numbers on the walls in different colors though, that’s about as much detail as you will get aside from a few lines here and there to simulate plain old bricks and wood. The Sesame Street characters are detailed nicely though and stand out in the bland rooms. The sound in this game is what you would expect from a title in the company’s kiddie line: it’s looped, and there isn’t much of it. There are all of about three or four background songs, and the sound effects are few and far between. The sound effects aren’t too bad though. You constantly hear the “Aooop!” sound of Grover’s jumping as you constantly jump throughout the game, and that can get annoying, but the other sound effects are tolerable. Expect to hear a LOT of the same stuff used over and over again. In conclusion, this game is yet another typical Sega Club game: A licensing cash-in designed to sucker people in with its television characters and end up disappointing in the gameplay department. This game is not recommended for anyone over the age of about six, but for those of you trying to get your young children to play Genesis, I would highly recommend this game. They’re bound to get a kick out of the Sesame Street themes and it will help them learn to count. The game sets out what it’s meant to do, but that’s it. It strictly caters to its extremely young audience, and doesn’t do anything spectacular, even in that category.